In the comments of their poster entitled “Welcome to Grade THREE!”, the Battalion Bloggers asked some questions. Posts lead to questions and questions to a search for answers. Below is the next part of our shared learning journey as I attempt to find answers and learn more along the way. I know you're having are busy in school at this time and I have been very busy with DVD/CD work for schools and community groups so it seems it can take us some time to reply to each other but our contacts are always interesting. We are glad that the perentie and lace monitors are only slightly venomous and that they are shy and will run away when they see people. Can the perentie and lace monitor venom kill a person if they bite them? In the original post, I mentioned the monitors are thought to be slightly venemous but I haven't heard of any deaths from monitor bites in Australia. 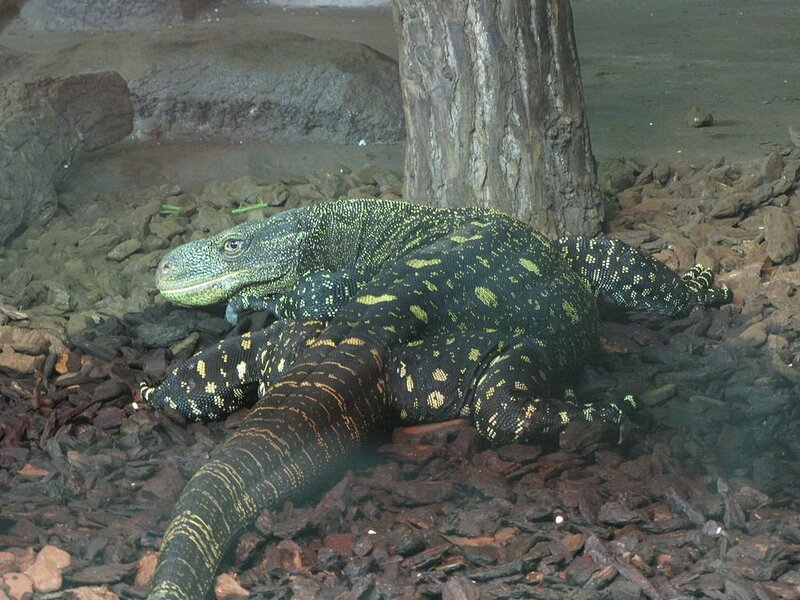 Some of the effects of a monitor bite from lace monitors or Komodos might be (according to Wikipedia's Komodo reference) rapid swelling, localized disruption of blood clotting, and shooting pains, with some symptoms lasting for several hours. 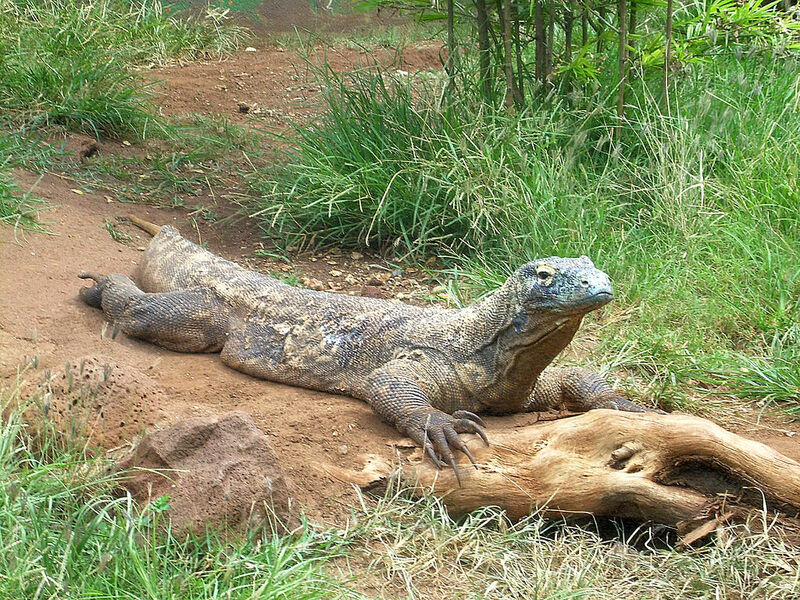 The large Komodo has been known to attack and kill animals such as goats and there are reports of human deaths. As with all animals, we should be careful with the biting end and leave wild animals alone. We wonder why the komodo dragon is only found in Indonesia now and not in Australia anymore? The photo was sourced through Wikimedia Commons where it was listed as in the public domain. Different species of monitor lizards are found in many countries. According to Wikipedia, they are found "through Africa, the Indian Subcontinent, to China, down Southeast Asia to Indonesia, the Philippines, New Guinea, Australia and islands of the Indian Ocean, and the South China Sea. A large concentration of monitor lizards occurs on Tioman Island in the Malaysian state of Pahang." What this suggests is there are many species of monitor lizards. 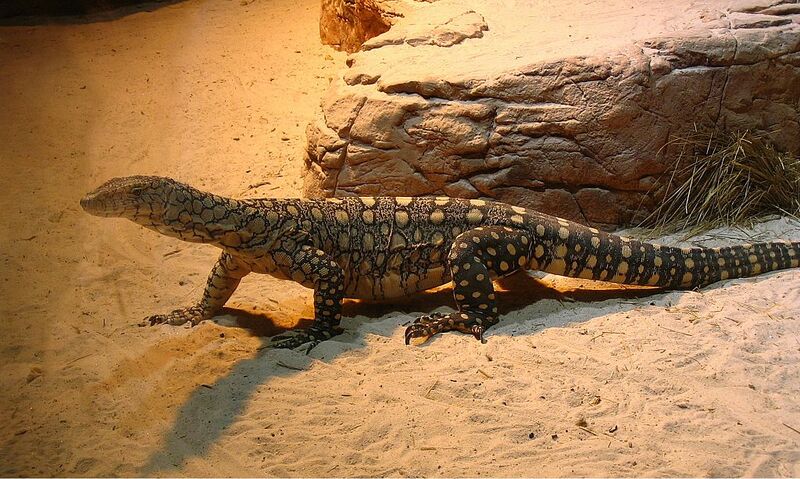 The Komodo, perentie and lace monitors are just three. 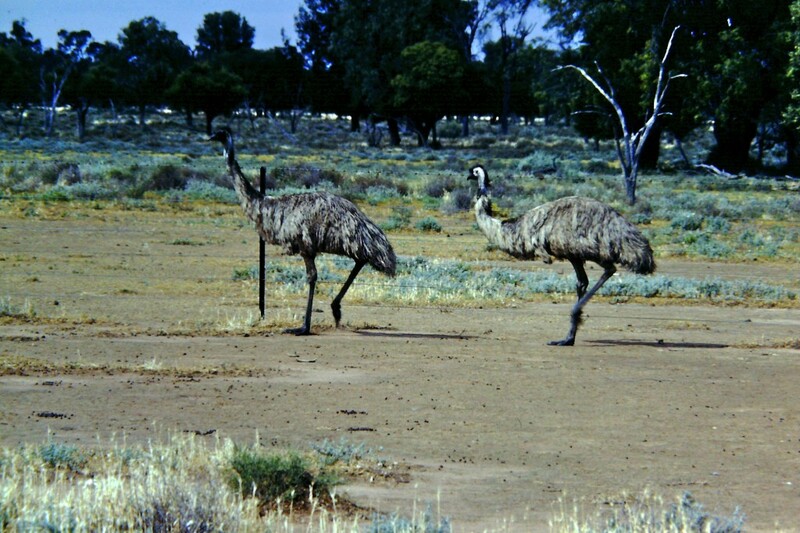 HOW could they get to Indonesia when they once roamed Australia? 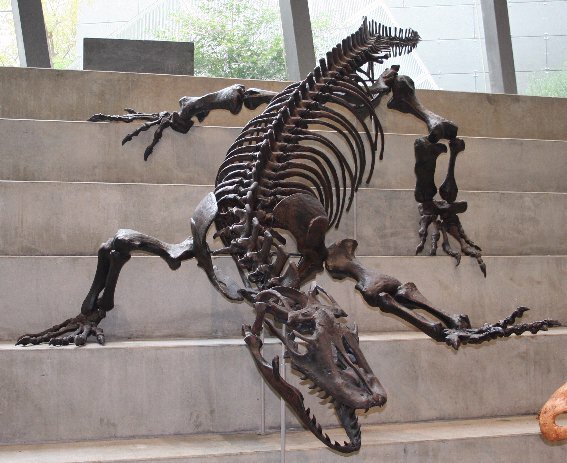 In my post, I mentioned fossils of Komodo dragons were found in Australia so they had once been here. If you look at the Komodo Dragon Evolutionary History link, it mentions recent fossil finds in Australia suggest it's possible Komodo dragons evolved in Australia and spread to Indonesia when sea levels were much lower during the last glacial period (around 12,000 to 110,000 years back). 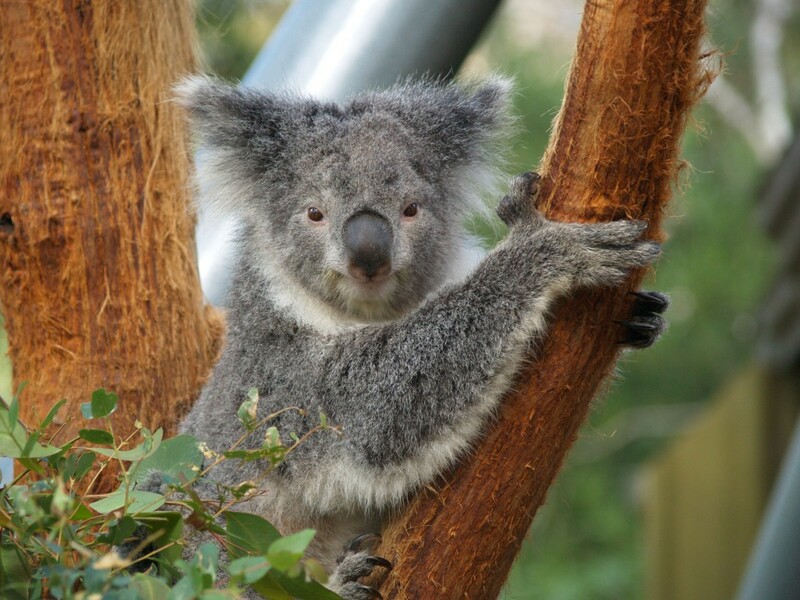 With the end of the glacial age, they were cut off from Australia by rising waters. Perhaps a changing environment wasn't suitable for them here in Australia so they died out leaving the Komodo only in Indonesia. We would need more information to be certain but, at this time, an accepted belief is the monitors evolved in Asia perhaps 40 million years back and then spread. 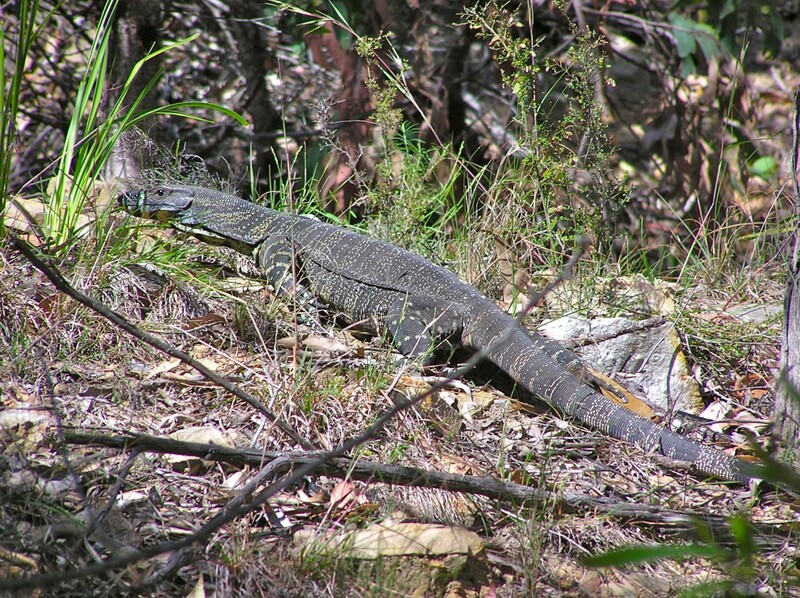 We also have evidence of much a much larger monitor lizard in Australia known as Megalania (Megalania prisca or Varanus priscus). 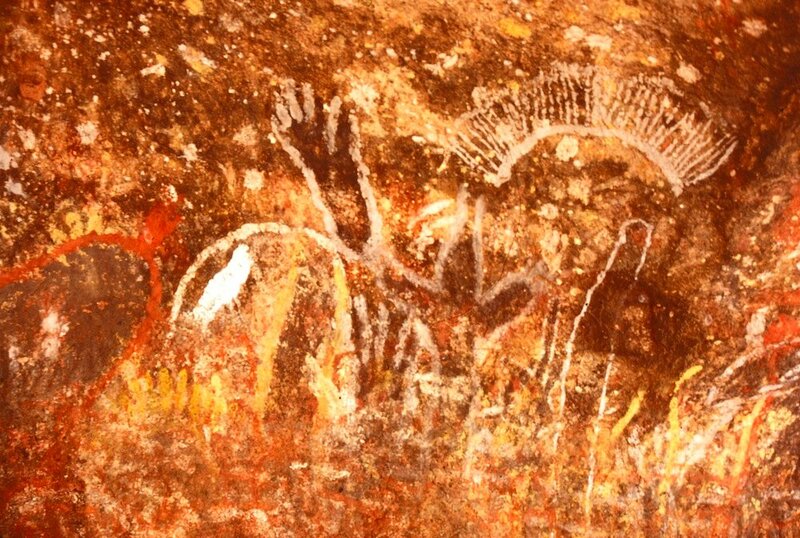 It is thought to have died out 30,000 to 40,000 years back so it's possible the earliest indigenous Australians had seen them. Most recent estimates say they might have grown to 4.5m (15 feet) and weighed up to 331kg (730lb). With the largest wild Komodo measuring 3.13 m (10.3 ft) long and weighing 166 kg (366 lb), the megalania would have been huge. I wouldn't go hiking in our national parks if they were still around. We wonder if they lived in both places but then they died out in Australia. I liked your suggestion and suspect there was a time when they were found in both places. Somewhere back in time monitors must have had a common ancestor. The different species evolved when populations were cut off from others. Adapting to the local conditions, in time they developed differences to other populations. When there is enough change so one population is unlikely to breed with another*, they are said to be a new species. Look at the monitor lizard below. It is a varanus salvatorii (Salvatori's monitor) from New Guinea. Do you notice all of the monitor lizards on this post have similarities? They are all part of the genus varanus (monitor lizards). Do you see they also all have differences? The differences suggest different species. * There are examples where animals of different species can interbreed (have babies together) so long as the animals are of the same genus. Why would they die out? As mentioned above. the Komodo dragons may have died out in Australia because of climate change. 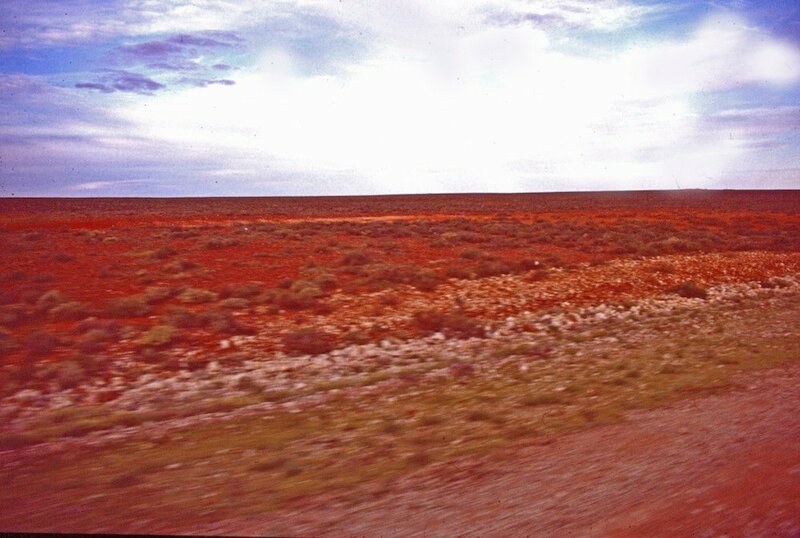 As an example, when the first people came to Australia perhaps fifty to sixty thousand years ago, Australia was much wetter with forests and lakes. 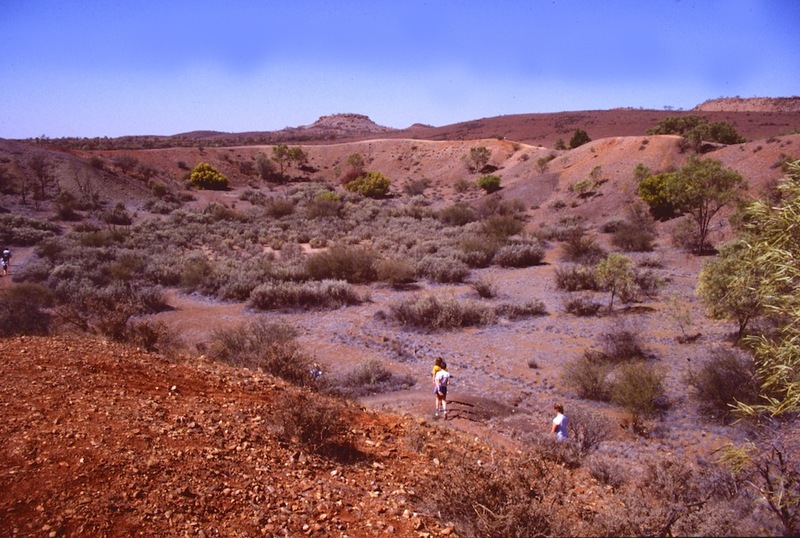 In time, changes in climate led to Australia drying out leaving desert where once there was forest. 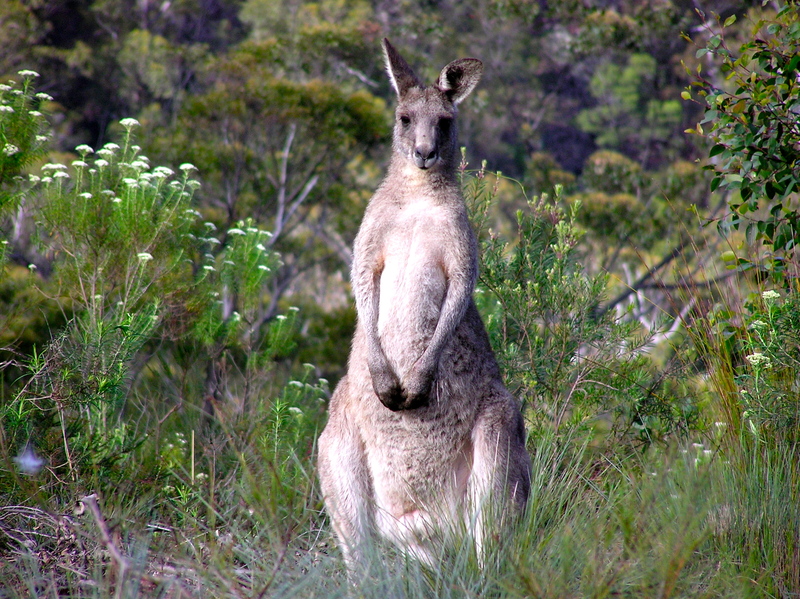 There might have been other reasons why they became extinct in Australia but, without evidence, we're only guessing. Spike is SO cute! We think that the picture of the echidna digging his claws into the grown and curling into a ball to protect himself was SO cute! Do echidnas get frightened easily? When I discovered an echidna in my garden, it was probing the soils with its snout in search of food. It didn't take much notice of me and I suspect their eyesight isn't too strong. When I came too close, it dug its claws into the ground and showed its spines. I don't think they are too easily frightened but, just like you, they are careful if danger is near. Once they feel danger has gone, they go back to their hunt for food. We wonder if they do much damage to gardens like voles can do? If I hadn't seen the echidna in my garden, I don't think I would have known it had been there as they leave little trace. It's possible others have been in my garden but I have only ever seen one. I have seen many in the wild. 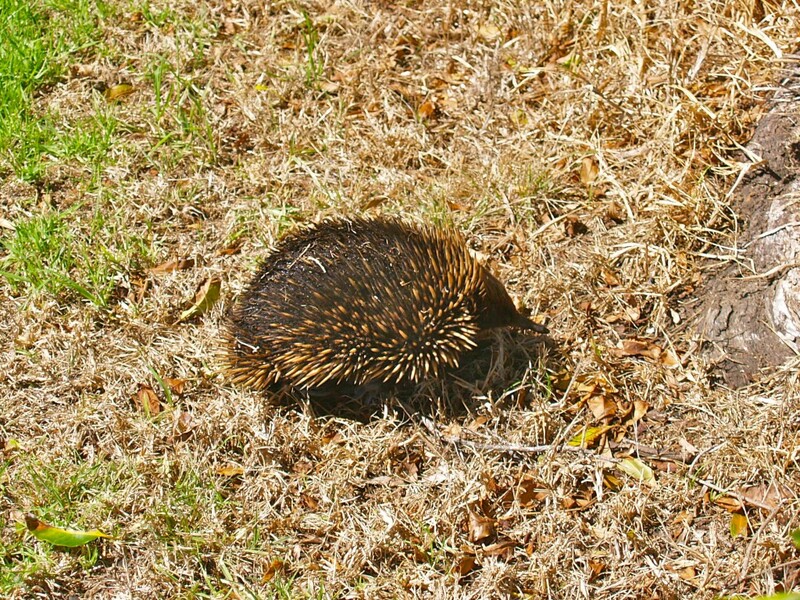 I saw the above echidna waddling its way across a local park. Even though I was close, it either didn't see me or wasn't frightened. We wonder what they like to eat … besides ants! In the wild, the echidnas mostly eat ants and termites. 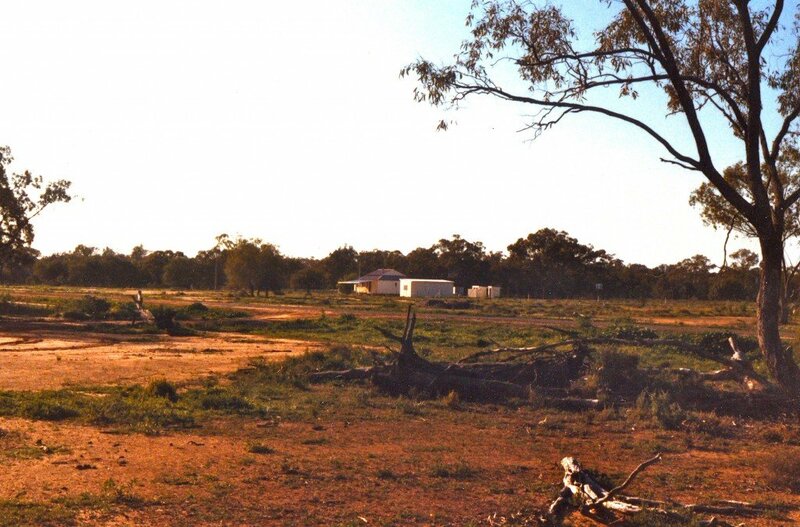 The above photo shows a local termite mound around 1m high although I have seen some termite mounds much higher in other parts of Australia. 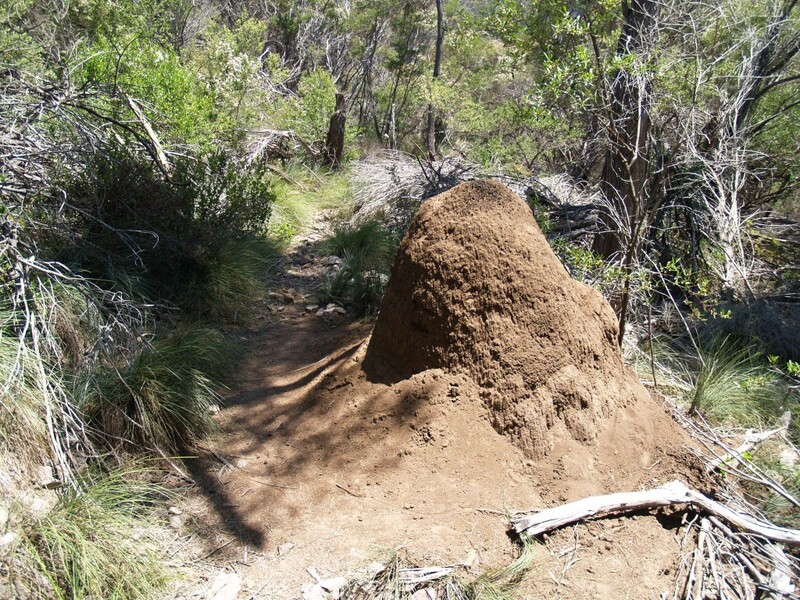 When hiking, I sometimes see termite mounds where I can tell echidnas have been using their strong claws to dig. 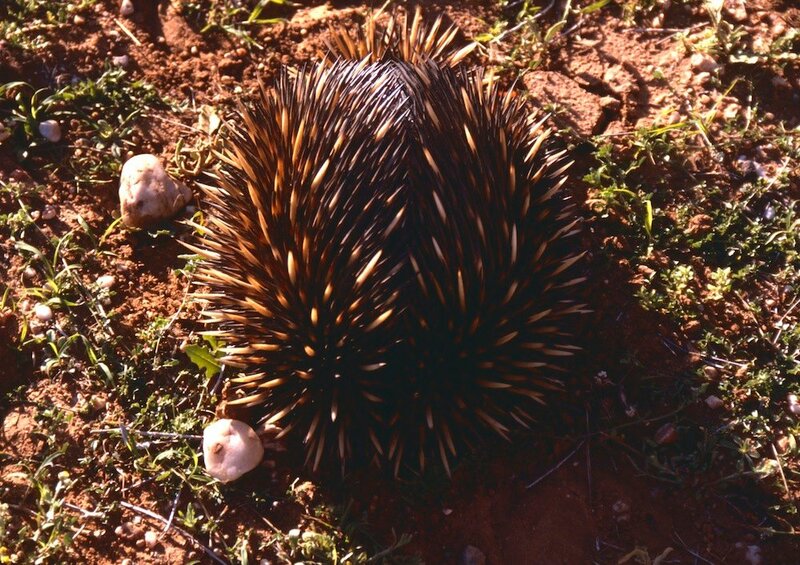 Once opened, the echidna can use its long, sticky tongue to catch ants or termites. My favourite local animal sanctuary, Potoroo Palace , has three echidna. It isn't possible to gather enough ants or termites for them so the keepers mix a special recipe to feed their echidna. The mix includes minced meat, olive oil, raw egg, glucose powder, baby porridge, processed bran, vitamin E powder and calcium powder. In the video below, you will see Spike enjoying a meal as the keeper shares information with tourists. We wonder how small an echidna’s egg would be. We STILL think it’s SO cool that they are egg-laying MAMMALS like platypuses! Echidna eggs are only about 2cm across. The females produce only one small egg about two weeks after mating. It's egg is placed in a backward facing pouch where it hatches about 10 days later. 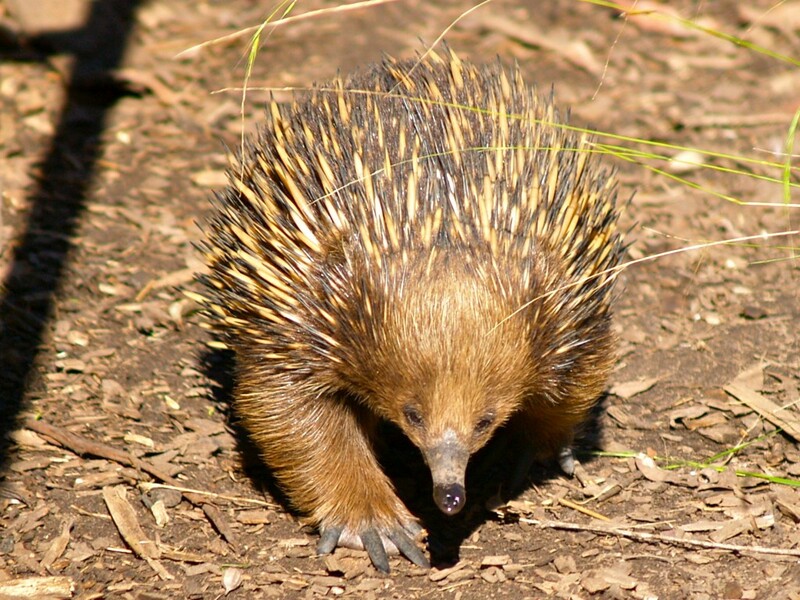 The baby echidna (known as a puggle) stays in the pouch for about two to three months before it's ejected from the pouch. It's spines start to develop in the pouch. Can you imagine a mother with a spiky baby in it's pouch? Perhaps when the puggle gets too spiky, mum thinks it's time for baby to leave the pouch. How BIG do echidnas grow … we wonder if our Grade Six teacher would be a GOOD referent for measuring an echidna! Long-beaked echidna can be 45cm to 100cm in length and weigh around 4kg to 9kg. The short-beaked echidna in my area can be around 30cm to 45cm in length and weigh 2 to 7 kg. 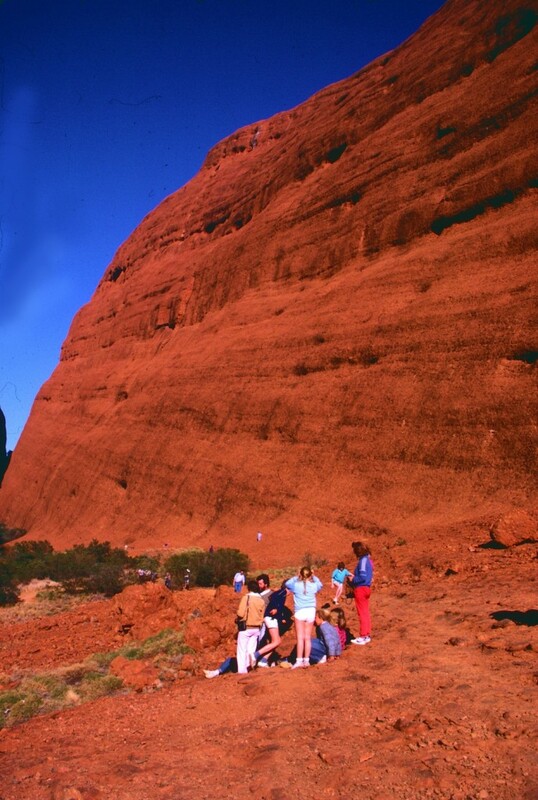 We really enjoyed seeing all the pictures of your fieldtrip to the Outback! It looks like hardly anybody lives there. It would probably be a hard place to live because it looks like there aren’t any stores around to get food or water. It looks SO hot too! 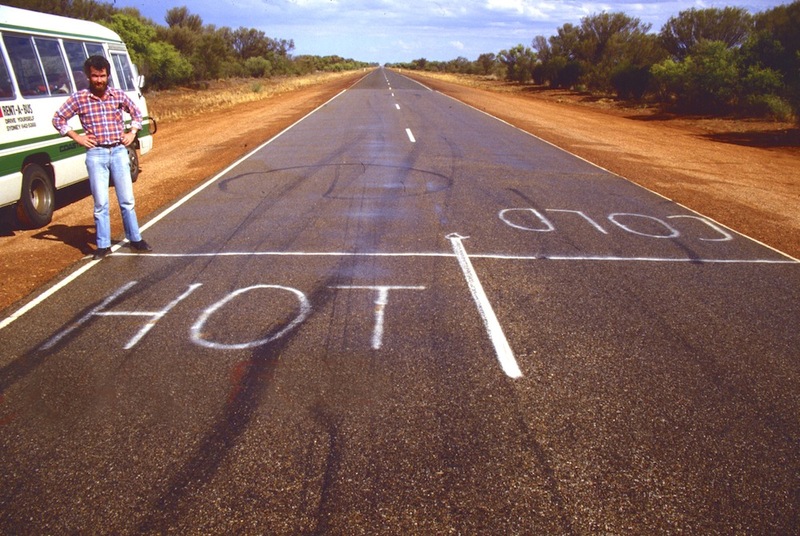 Summer temperatures in Australia can reach over 40C in summer. There has been a few examples measured up to around 50C. 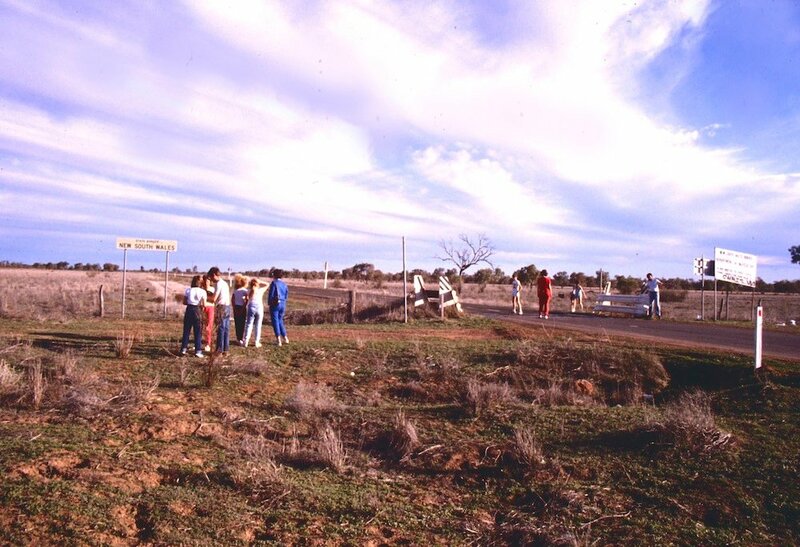 My first full time school wasn't in a desert area but was in a semi-arid (not quite desert) area. I recorded a maximum temperature in the shade of around 45C for two weeks running. 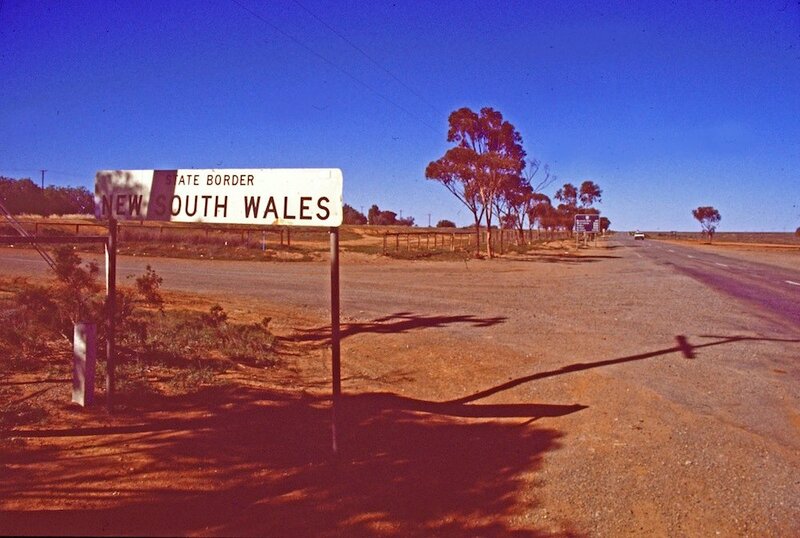 As the sun goes down, the temperatures in Australian deserts can normally drop down to around 3C to 6C and there have been recordings of temperatures as low as -7C in Alice Springs in winter. 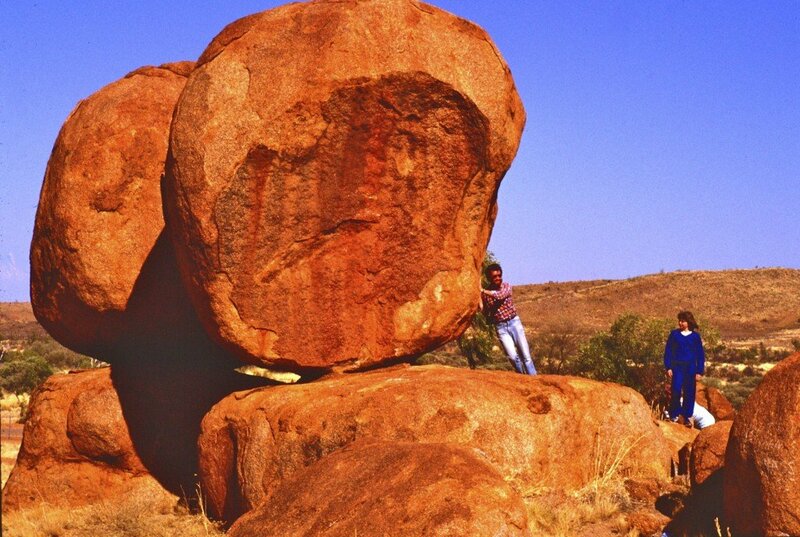 In the top photo, you can see Karlu Karlu has many such granite rocks but they haven't been stacked. The second photo gives you an idea of how large they can be. 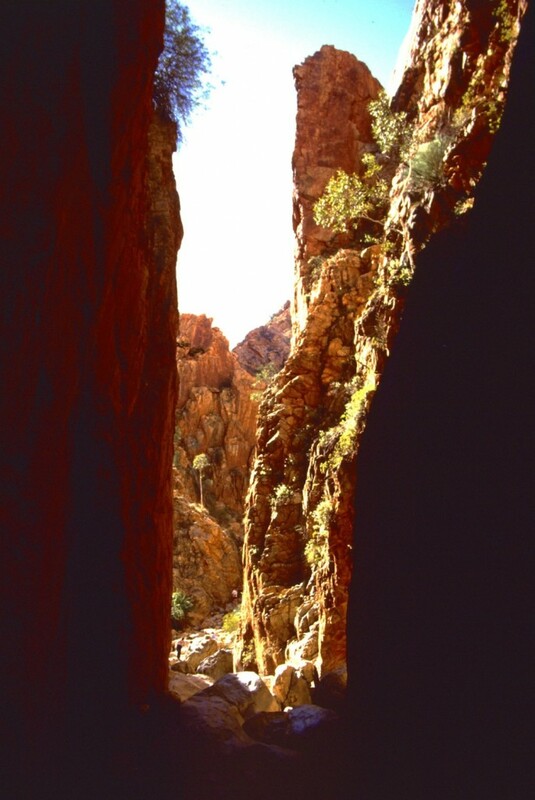 The man in the photo is standing on and leaning against the same rock. Erosion by rain and wind has been at work wearing away the rock at what looks like the base of the upper section. The upper section will eventually break off and fall. Maybe it already has. The photo was taken 28 years back but the erosion is a slow process. 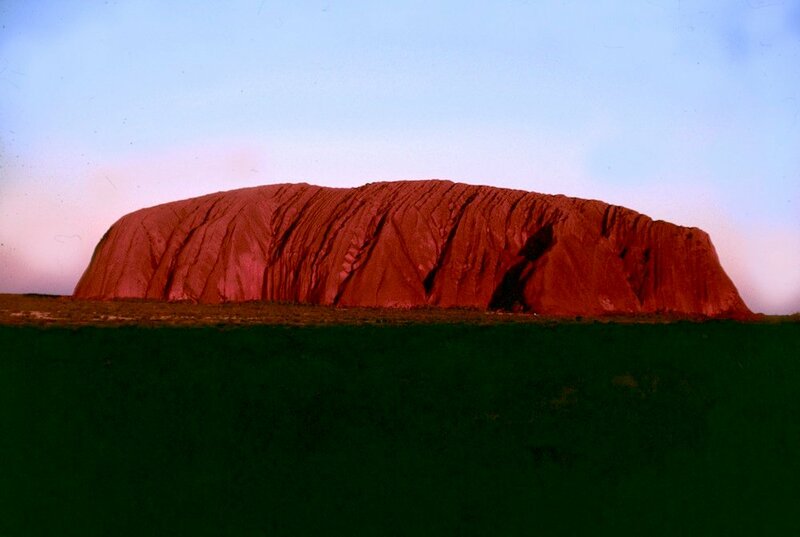 … and also how old Ayer’s Rock is! 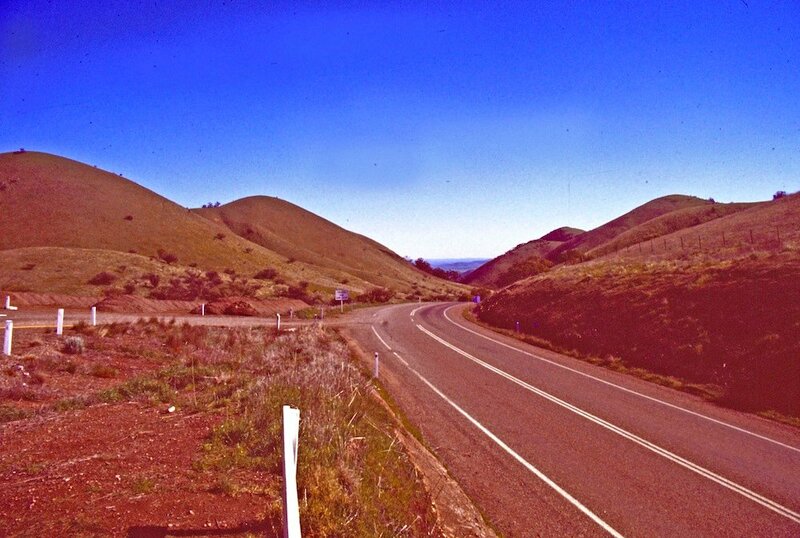 It just looks like a place where tons of poisonous snakes and spiders would live. 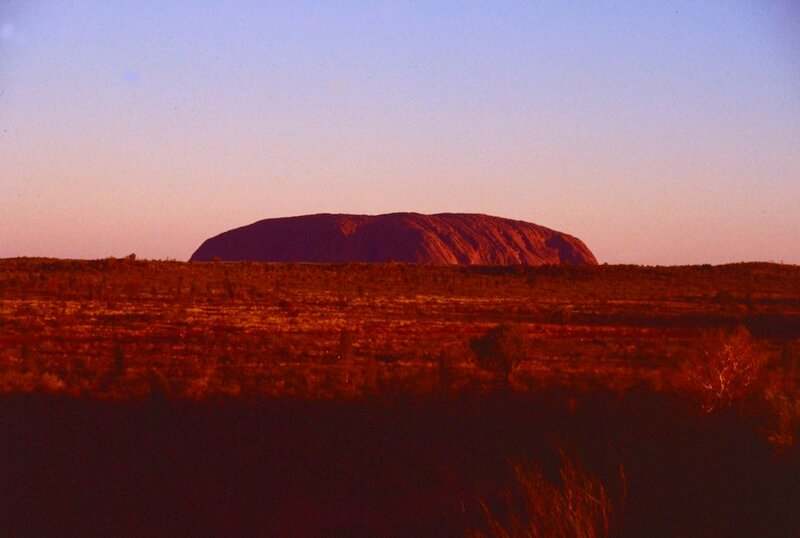 Uluru is known as a monolith (single stone) and is sandstone. 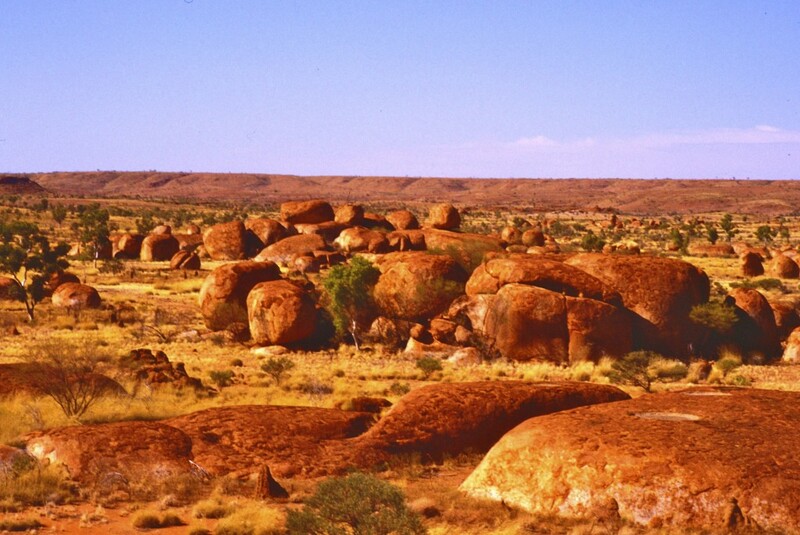 The sandstone was thought to have been deposited perhaps 550 million years ago. 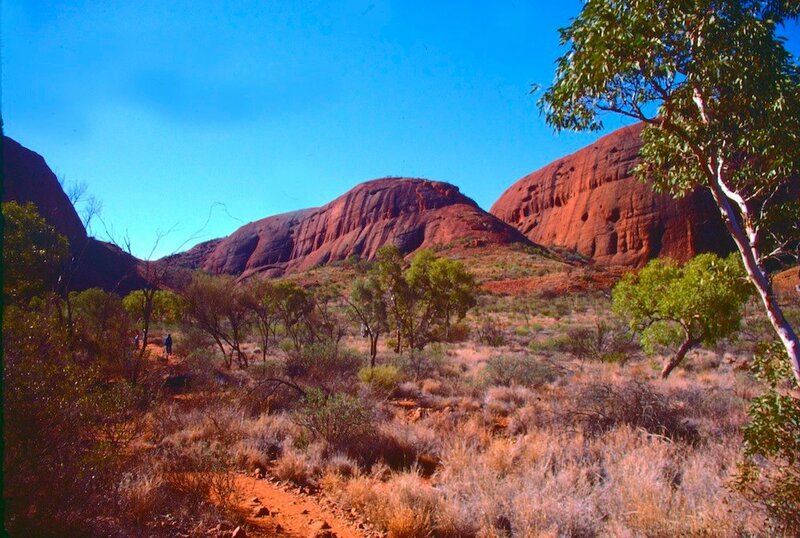 There are snakes and spiders around Uluru but I think the snake is the woma python. Being a python, it isn't poisonous. There are poisonous species of snakes in my area near the coast. They are the red-bellied black snake, brown snake, tiger snake, and death adder. I have seen the first three in the wild but, as yet, haven't seen a death adder. Do armadillos live in the outback? Armadillos aren't native to Australia. How long and how tall is Ayer’s Rock? It is really much larger than what you can see in the photos. Most of it is below the surface. 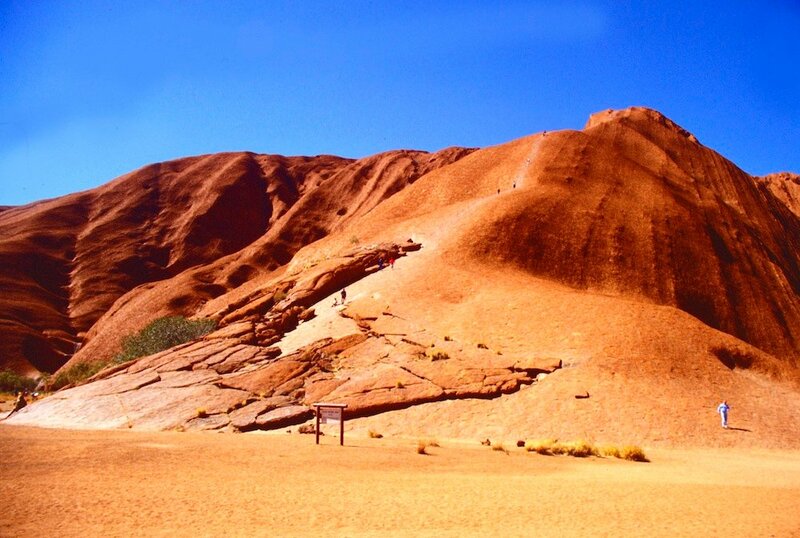 If you were to go for a walk around the base of the Uluru you see in the photo, it would be a walk of a little over 9km (~6 miles). The second photo gives you an idea of how high it is. 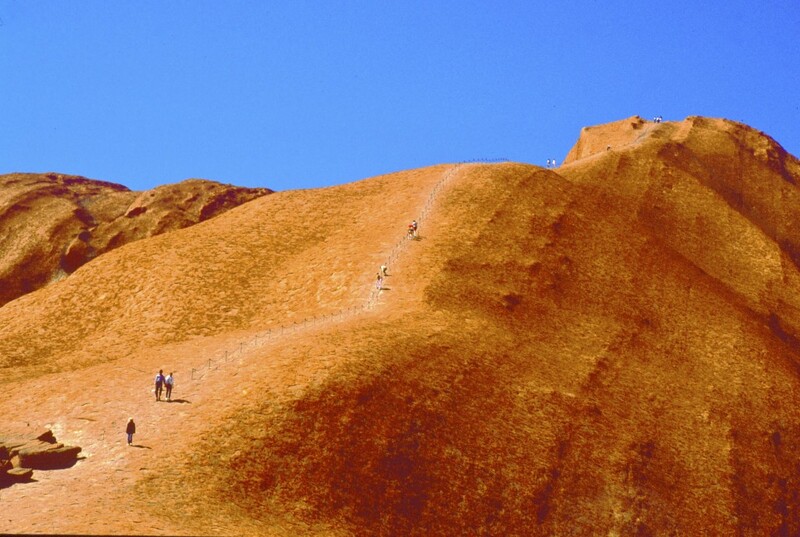 You can see people have climbed to what looks like the top although the real highest point on Uluru is 348m above the base and is to the left and not quite in the photo. 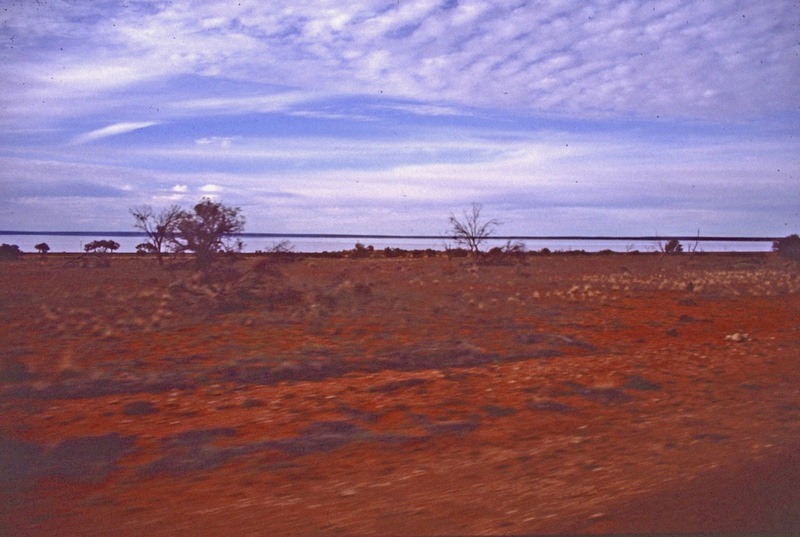 We LOVED all your pictures of the outback. We loved how you told us that people would build their houses underground to stay cooler. How would they get to their houses? 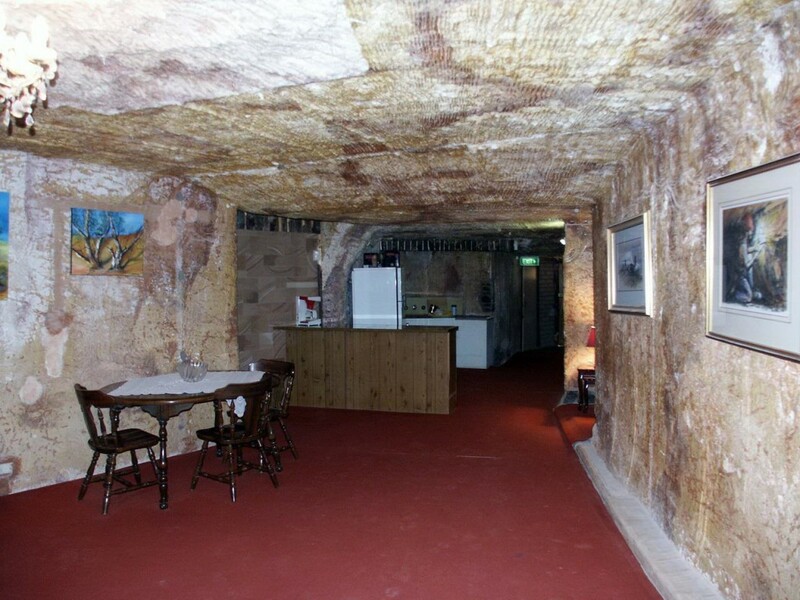 Coober Pedy's underground homes can be basic but I have been inside one I would consider more luxurious. It included a swimming pool with a walled part built out of the home. Like most homes, it had a front door, rooms, furniture and electricity. While there are no windows in walls, there are vents in the ceilings for light and air. What would happen if a rainstorm came … would those houses get flooded? 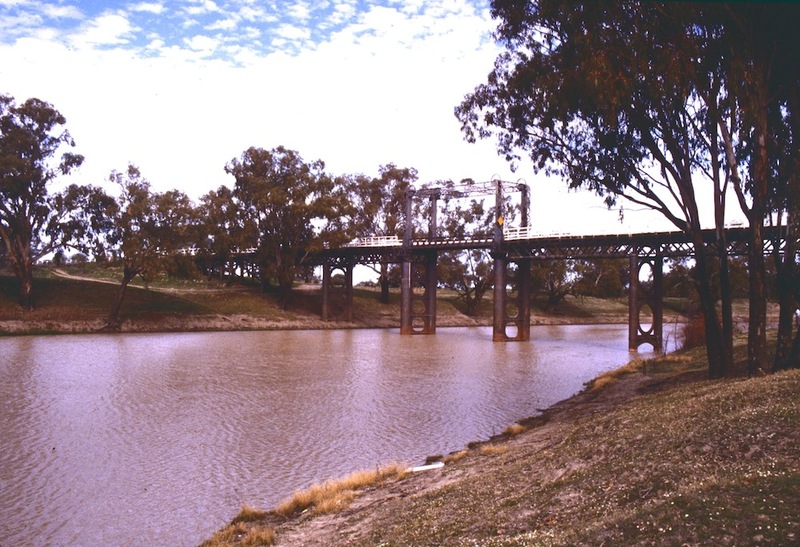 Being in an arid area of Australia, its average yearly rainfall is only about 156mm (about 6") so flooding isn't too much of a problem. The homes also tend to be built into hills and not low where water might be a problem. Do the houses leak when there is a rainstorm? Low rainfall means having leaks would be a rare but I guess they would have big problems if climate change brought much higher rainfall. 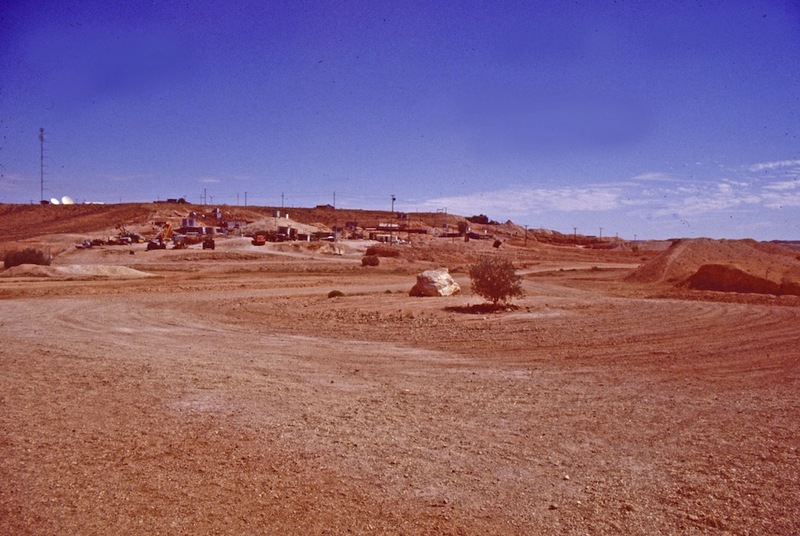 People find being underground is more comfortable where summer temperatures have reached as much as 47C although the average summer temperature is 30-32C. 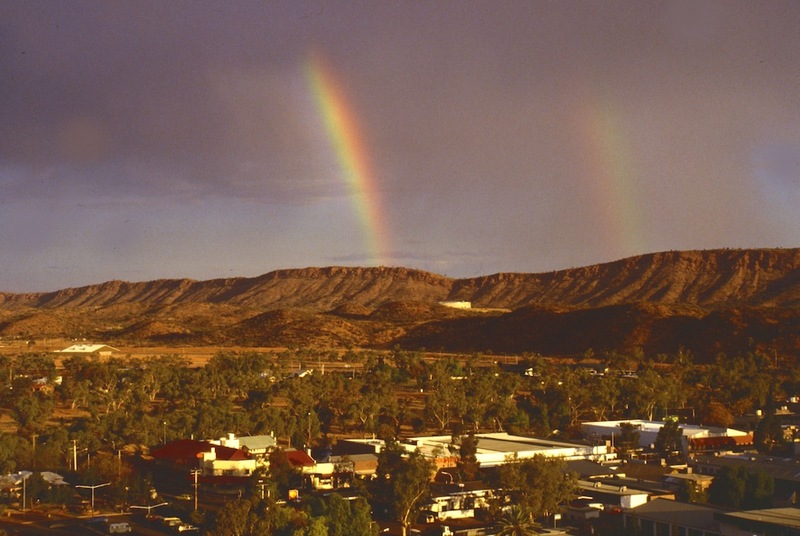 The big attraction for living in Coober Pedy is the opal. Opal is mined and made into jewellery. Wouldn’t it be hard to dig into the ground to build a house? 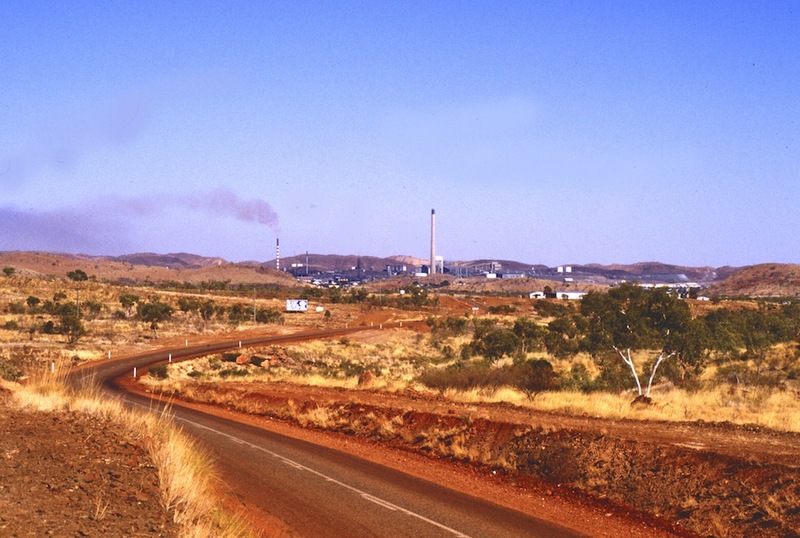 Many in Coober Pedy are miners. They can use digging machines to dig mines in search of opals or to dig homes. Early settlers probably used a pick to dig their homes. Imagine, you don't need bricks or timber if you want a new room, you just need a place to dump what you dig. If you're lucky, you might even find opal when digging your house. I thought I had a photo of a home interior but I haven't as yet located it amongst thousands of old photos so below is a photo I found through Wikimedia Commons. The home I visited looked very solid. Experienced miners would know the danger of cave-ins if they weren't careful. You would probably find the town has rules on how dugout homes should be built. I suppose a serious earthquake might cause problems but serious earthquakes are rare in Australia. We wonder, if they go out, how do they find their houses again, if they are underground. Do they mark an x on the roof? Like you finding your home, they know where their homes are in town so they wouldn't need to mark their homes. They might simply remember it's on the north side of the third hill from the local shop. 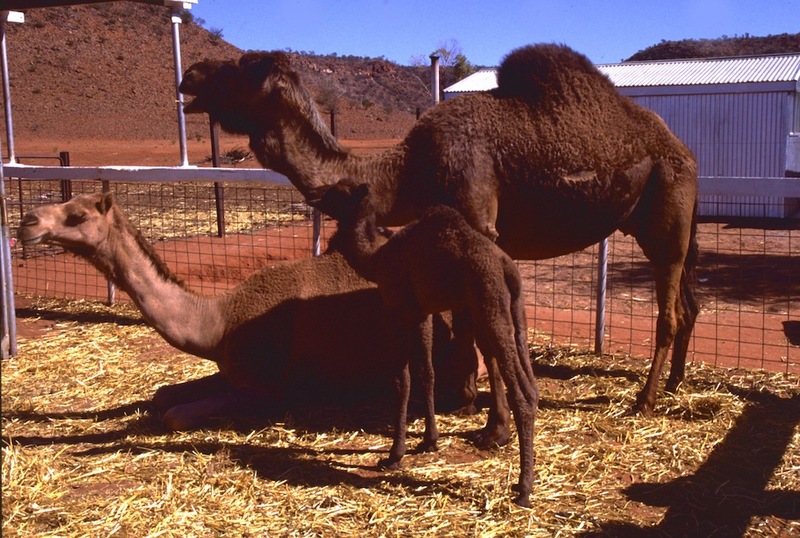 We wonder what kinds of animals live in the outback. That is a big topic so let's look at the area around Uluru. 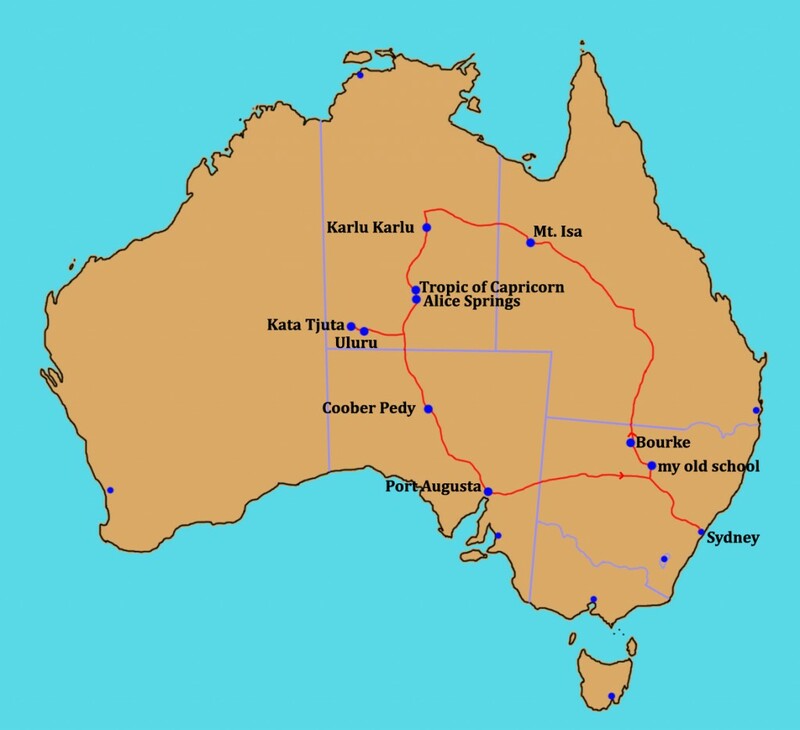 Go to the Wikipedia reference on Uluru and scroll down for some details. There are known to have been 46 mammal species found around although there are currently only 27 including bats. There are also birds, reptiles, insects and frogs. Frogs in the desert? 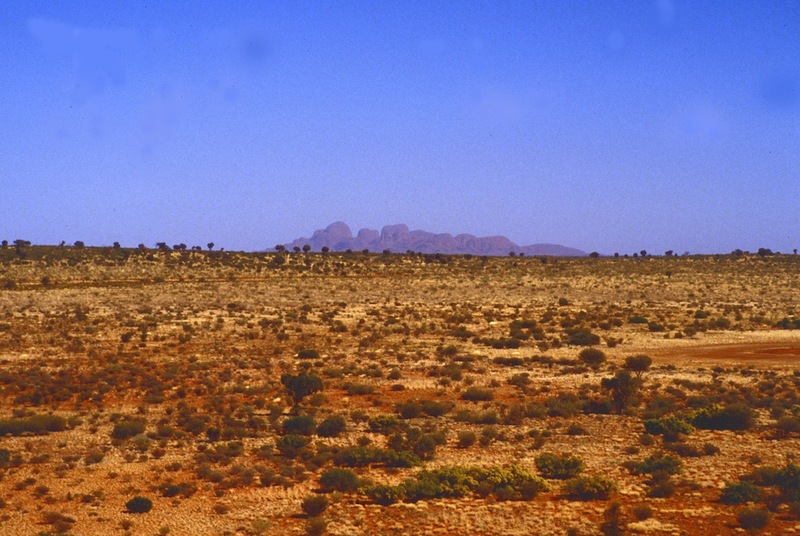 There are four known species of frogs found around the base of Uluru where you also find waterholes. There can also be introduced animals such as mice, camels, dogs, foxes, cats and rabbits. 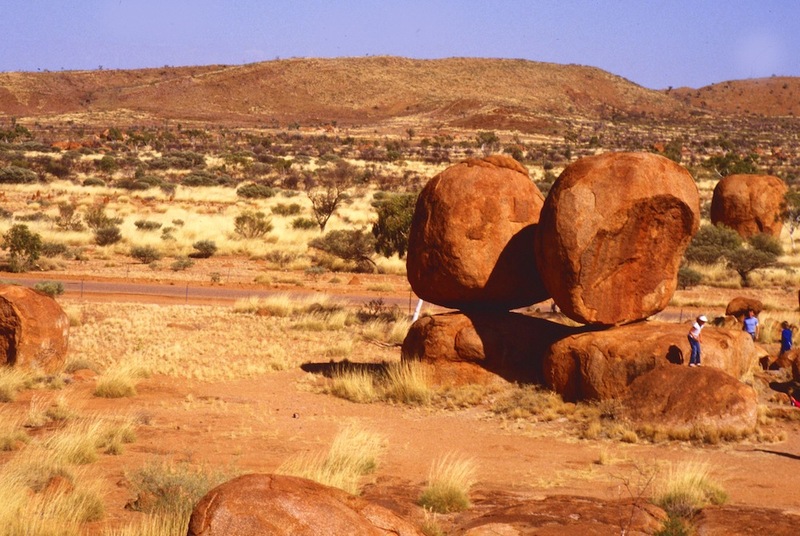 Posted in Animals, Australia, Cultures, Environment & Weather, Geography, Geology, Plants, Rocks and Minerals and tagged Ayer's Rock, Devils Marbles, echidna, Karlu Karlu, Kata Tjuta, komodo dragon, lace monitor, perentie, The Olgas, Uluru, varanus salvadorii tropicario on November 29, 2013 by rossmannell.